A father who committed suicide on Yuh’s 16th birthday. Ba-dump Ba-dump; a guy so breathtaking. A proposal at a sky resort. All those to interrupt our love are so dead! Thank you so much for doing this looovvve you soo much =))) are you only putting up one volume a day or ?? Many thanks Meriem! Can't wait to go through this one. Thanxs for the FYI, I think it's fixed now. Okay, sorry about that, vol 3 and 4 should be fixed now. Thanks so much for the upload. I think there's a problem with volume 2 though..
You're welcome. Hope you enjoy!!!!! what language is that rose? I don't know who you are but you have a big heart. 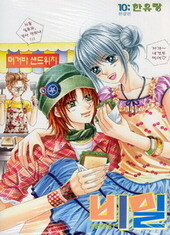 Thank you so much for sharing this manhwa with us. I have been looking this for every where. Thank you. Thank you. You make my day! Can I know what the password is? T____T The files seem to be locked? Hi meriem, like the flowers and colors!!!! I know I'm really late but the download said its removed if you can, can you please re upload it? uptobox.com is not available in my area. Is there any way I can download and read the last volume ? volume 9 says "500-service not available "